Schools involved in TSP in recent years may be interested to know that an alliance is being forged with OYTI for schools visits from now until the 2012 Titanic Centenary. Titanic educational workshops already run by TSP will now be augmented with practical demonstrations of seamanship in the classroom and playground with the opportunity for students as young as 10 years old to take part in sailing exercises each year! 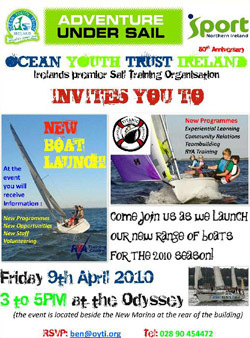 If some of your pupils would like to find out more why not bring them along to the OYTI event as per the attached flyer on Friday 9th April behind the Odyssey when students will be able to see the FIFTEEN boats which students can use to learn to sail in a later date in the Summer.